Where are all the jobs gone? Finding work has been a challenge in the current economic scenario. The Union government's efforts to try and suppress the job data numbers of National Sample Survey Office (NSSO) for over two years have drawn political flak. For those who are wondering where all the jobs have gone, or could come from, this book offers certain plausible answers. Have you read about self-driving cars, blockchain technology, IoT (Internet of Things)? Have you ever registered for an online open university course? Do you have any form of use of automation or artificial intelligence? If your answer to these questions is a 'yes,' 'Jobs Crisis in India' by Raghavan Jagannathan can help you understand how automation would change the job market in the near future. The book starts with a comparison on the number of jobs created by the top 10 tech firms of today and the top 10 manufacturing firms during 1979. While the top ten tech firms employed 1.5 million people, the top 10 manufacturing firms provided for 2.2 million jobs back in 1979, the author says in the book. With automation providing for great savings on labour cost and producing cash surplus for US giants like Apple, Microsoft, Google and Cisco, Jagnnathan identifies two things to be in chronic excess— capital and labour. The situation, the author says, could have lead to job loss of 1.5 million people in the telecom, IT services and BFSI sector in India, during 2017 and 2018. 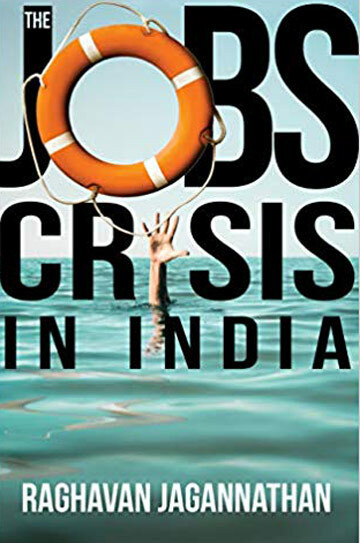 The author, who is a seasoned business editor and political writer, speaks his mind on the job scenario in India and pegs unemployment rate to be between 2 to 6 per cent. The problems according to him are low wages and abysmal participation of women in the work force. By the end of the book, he also states that about six to seven million jobs are being created in India every year. But with automation at the doorstep of India, this numbers could change drastically, he says, taking into account a number of credible crystal-gazing on the automation question. Citing global consultancy McKinsey & Company's understanding on impact of automation on jobs, he says $1.1 trillion worth of jobs at risk, and anticipates more than 233 million job losses as automation is adopted in large scale. The book rightly argues that automation has so far created only low quality and low skilled jobs. Google hiring 10,000 people to clean up content on YouTube or Paytm hiring people for Aadhar verification are some of the jobs that are created after automation, he writes. Another example is that of drivers who have no power in negotiating terms and instead the platforms like Ola and Uber becoming more powerful. Jagannathan terms these as temporary jobs, which would not bring in the desired boost to either income of people or the economy. But the book is not all about painting a doomsday picture. It features interviews with three personalities: Arvind Panagariya, former vice-chairman of NITI Aayog, Nandan Nilekani who was the man behind Aadhar or UIDAI in India and Manish Sabharwal, founder of HR consultancy firm Team Lease. All of these interviews form bulk of the later part of the book, which gives a wide-angle glimpse of the future of jobs and brings in optimism of some measure for future. In the fifth chapter, Jagannathan makes an interesting attempt to answer the question, where is the robot in our lives? When is artificial intelligence taking over? To answer this, he recounts another McKinsey report which points that less than five per cent of our jobs are fully automatabale. Which means that human role would still be vital. But where exactly? He looks to the government as a major employer with artificial intelligence and automation taking over a large number of areas. Other than in railways, Jagannathan says jobs would be created in the defence sector as well. The focus would be on technologies like drone and cyber warfare. Besides, in areas like healthcare, law and order and judiciary, the government would need to provide more jobs as automation progresses, the author predicts. He expresses optimism that the demand for high quality jobs would be more compared to demand for low skilled jobs as automation progresses. With cities being central to employment and job creation, Jagannathan promotes the theory that cities could be the future provider of jobs for India. He cites the city of Coimbatore as an example of this. Once known as the pump manufacturing capital of India, the city is now home to 15 colleges and 60 technological institutions. Cities attracts migrants and they are great levellers in terms of jobs, he writes. The author points out that recent year trends in migration across India points to a preference for southern India. In such situations, Jagannathan notes that cities should be allowed to be developed and managed like board-run corporations. He cites example of a private SEZ developer in Coimbatore, KGIS, who managed to convince big firms constricted of space to grow their business in other cities. The result, Jagannathan says, results in extensions of borders of cities. Something which, according to him, is visible from nighttime satellite imagery of lights from Indian cities. Sometimes these extensions exceed the original boundaries of cities, proving the point that well-managed cities could, after all, be harbinger of jobs and economic growth. “Modern cities need more independence to run like board-managed corporation,” he writes. The book dwells on the prediction by Nandan Nilekani that lifetime employment would soon be a thing of the past. To re-purpose ourselves Jagannathan elaborates on his 10-points of personal advise which could be most helpful for any job seeker. Self-improvement is the key, he suggests. The starting point of his advise is: develop loyalty to yourself and your future first and to your employer later. The book argues for a UBI concept but says that would only be relevant at a later stage when the Indian economy could afford its burden. Instead, he suggested that re-skilling and widening scope would lead to better employment contracts in the future. The book ends on an optimistic note on the government's progress on achieving the JAM (JanDhan, Aadhar and Mobile) trinity. The critique of these are limited in the book including any clarity on to what extent it has benefited the economy or the jobs market. The interviews of Panagariya and Nilekani are the most eye-opening if you are wondering on the jobs question and feature towards the end of the book. Overall, this book is a repository of a number of reports and studies on automation and job scenario and provides a directions for policymakers and job seekers alike.